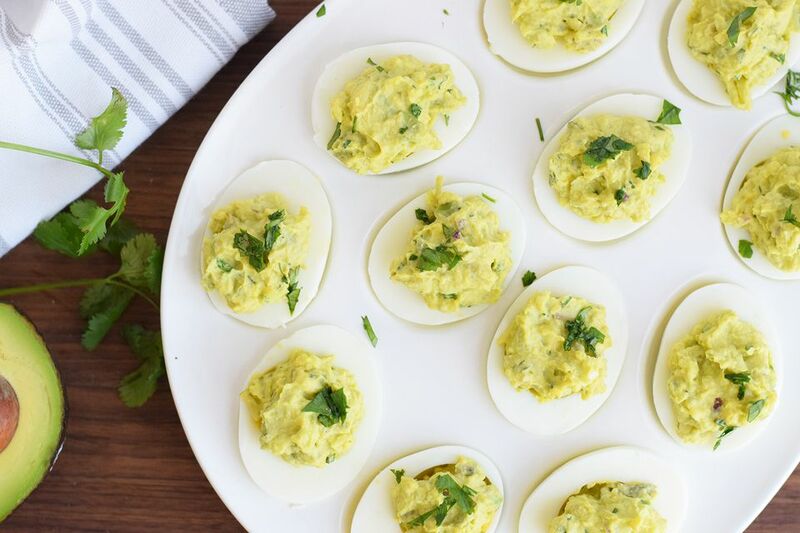 Who knew deviled eggs and guacamole were such a match made in heaven? Together, the two classic party appetizers are a totally swoon-worthy snack that everyone will love. They're creamy, tangy, and—if you want it to be—spicy. Served the bite on an egg plate for a celebration-worthy presentation. Deviled eggs are always a favorite appetizer, but sometimes you want to switch it up from the traditional recipe. Merging the flavor of guacamole with the richness of a deviled egg, this South meet South-of-the-Border canape is the perfect creative answer. It's one you can serve at spring and summertime celebrations, from Easter to Cinco De Mayo to warm-weather potlucks. Give them a kick by adding some jalapeno or keep it simple and kid-friendly by leaving it out—either way, these little babies are sure to please and will be gobbled up quickly. Slice the hard-boiled eggs in half and scoop out the yolks. Place the yolks in a bowl. Place the white halves in an egg plate or on a tray. Mash the avocado in a bowl with a fork or potato masher. Leave it as chunky as you wish or make it perfectly smooth. Add the egg yolks, cilantro, onion, lime juice, and minced garlic to the mashed avocado and mix them all together until completely combined. If you're including peppers, add them into the mixture now. Season with salt to taste. Place the filling in a piping bag or simply use a spoon to add it into the wells of the egg white halves. Add a little chopped cilantro on top of the deviled eggs. Use this easy tutorial for the perfect hard-boiled eggs. Follow the tips and tricks and not only will there be no gray or greenish yolks, the eggs will be super easy to peel. It only takes 12 minutes to cook them and a few more for them to cool. You can also make the hard-boiled eggs ahead of time up to a few days in advance. Make sure to get perfectly ripe avocados as any browning in the flesh will cause a poor texture and taste. There are a few tricks to ripen avocados quickly if you can only find rock hard ones at the store. You can also try freezing a few ripe avocados so you can thaw them quickly when you need them. With Bacon: Add some crumbled bacon to the top of the deviled eggs. With Jalapeno: Mince 1 pepper and add to the yolk mixture. With Chipotle: Dice up a chipotle pepper and throw it into the mix with a little bit of the adobo sauce. You can also just dust them with a little dried ground chipotle pepper.